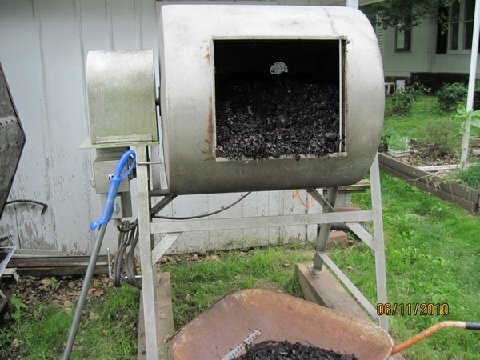 When my next-door neighbor, who has an infinite amount of practical knowledge, told me about a giant lottery drum up for auction as State surplus property - one he thought would make an excellent addition to my collection of motorized compost tumblers - I was skeptical. Years before I had seen such a drum on TV in Chicago when on Saturday evenings winning lottery tickets would be drawn from it, and remember it being taller than people standing next to it. But I had faith in my neighbor, especially as he supplied me with my first motorized composter. 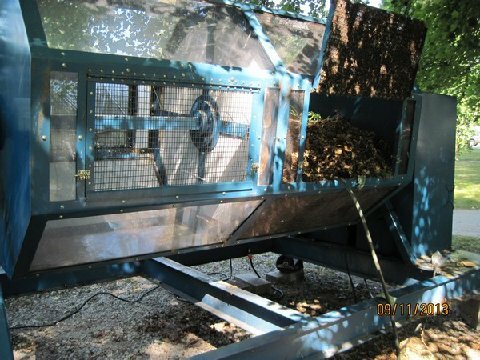 This earlier tumbler was basic, rusty and bent in places needing straightening for it to work, but in retrospect was an ideal design, with flat sides of stainless steel sheet with holes, forcing a compost batch to turn over upon itself and thoroughly mix. 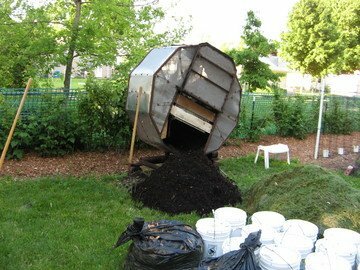 Here's a picture of the old one being emptied of its beautiful black, rich compost, next to a pile of grass clippings, buckets of coffee grounds and bags of mulched leaves ready for the next batch. So, now you can see, the lottery drum was a proper evolutionary step for me. But it had been mishandled, dropped on one corner violently forcing the drum out of its rear pillow block bearing and breaking the housing on a second bearing at the motor end of the drum shaft. One wheel base remains bent. With an outpouring of neighborhood help and humor, I got the monster fixed and running, and last weekend filled one section with a decent sized batch of compost mix. The drum worked like a charm, and the plastic divider I attached to supports in the middle of the drum is holding up just fine. With the divider in place I can start a new batch on one side while a second batch continues to "cook" on the other side. 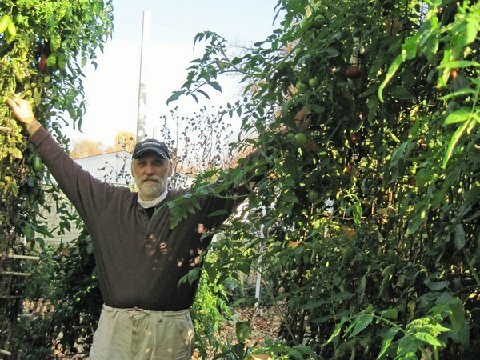 How do I make compost? I use a mix of fresh grass cuttings, mulched leaves I bag each Fall, and Starbucks coffee grounds from a local Barnes&Noble Café. I pick up four to six 5-gallon buckets of grounds from the Café each week. I don't use chemical pesticides, herbicides or fertilizers on my yards or gardens, and don't add livestock manures to my compost. I am especially concerned about antibiotics injected in and fed to farm animals, herbicides applied to pastures, and even arsenic included in chicken feed. Incidentally, the Mother Earth News magazine is a good resource regarding such food contaminants, as is the web site www.naturalnews.com. As you may have surmised, I am vegetarian. The Rodale Book of Composting is a classic for determining a proper mix of raw materials needed to maintain the ideal carbon/nitrogen ratio of between 25:1 and 30:1, with carbon being the higher number. One puzzlement I've had since starting a composting log back in 1999, is how to convert these ratios to a proper mix of leaves and grass, by weight and/or volume. What if the leaves are wet or compacted, while the grass is not, or vice versa? Perhaps a reader can clarify. My mix includes a greater volume of leaf mulch than of cut grass, and coffee grounds added to the mix are approximately one-eighth the volume of grass. Grounds include coffee filters, which are 100% carbon. I do let the pile of grass clippings sit a day before composting. Incidentally, pound for pound, the leaves of most trees contain twice as many minerals as does manure. Smaller sized particles in a mix make it easier for fungi and bacteria to do their jobs. That's why I use ground up as opposed to full sized leaves. I do throw in other greens, like the overgrown broccoli plants in my first lottery drum batch. I've read not to include roots of a broccoli plant as they may be diseased. I also add rain water (and not chlorinated city water) to the mix until it is moist comparable to a wrung out sponge. Too wet and the batch will develop a sewer gas smell, indicative of anaerobic decomposition. In the rare instance when such an odor is apparent, I immediately turn the mix for an extended period to oxygenate it and may add more dry leaf mulch. For a new batch, I begin by turning it for several minutes to thoroughly mix ingredients, then every 3-4 days for a two weeks, and after as needed, say, when I add water. Compost Thermometers, each with easy-to-read 3" dial, are hermetically sealed and recalibratable. • Choose 18" or 36" stem x 0.375" diameter. • Range: 0°F to 200°F. • 304 stainless steel external parts. • Features pointed tip for easy insertion. 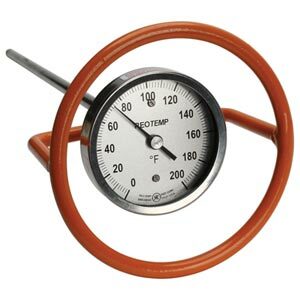 • For effortless insertion, we recommend the optional compost thermometer handle. Handle is detachable and threaded to fit 1/2" NPT male connection. I keep a log of temperatures for each batch, which helps me determine when more water or more turning might help. For the first couple days after creating a batch, heat given off from the grass alone will spike temps to 130-160 degrees F. Once successive types of bacteria and fungi begin working through the mix, a regular progression of temperature variation is evident, as one set of microorganisms prosper and then die off, and a competing one ascends. What I've seen over and over is the initial spike, followed by a decline to 110-130 degrees, and then a rise back up to the level of the initial spike, and finally a gradual decline to ambient temps. Four days of temps in the 140-150 degree range will kill off weed seeds. Temps above 165 degrees will kill the microorganism workers. More frequent turnings may keep highest temperatures in check, and - along with more water - may raise low temps, though the latter may just require more greens. Too much turning leads to "hot" or "fast" composting with loss of nitrogen as a gas before it can be bound into the compost material and available to plants in the garden. Finished compost generally takes me six to eight weeks, depending on outside temperatures. Ambient temps below 45 degrees will limit microorganism activity. Once out of the composter, I let a finished batch age for four to six months before incorporating it into my raised beds. I've read it is best to use it within a year. In late Fall I will mix a final batch and leave it in the composer till the Spring. Don't attempt to turn a frozen batch! After layering on compost, I drench my raised beds with liquid fish fertilizer, preferably from cold water fish. (12-28-2013 Note: Due to radiation from the Fukushima Nuclear Disaster, I no longer use nor recommend any North Pacific ocean products.) Alaskan Fish Fertilizer is available from Menards, Lowes, and Home Depot garden centers. I have also used liquefied sea weed (kelp), but with care as too much appears to retard plant growth, especially with plant seedlings. In addition, I have spread fine sand from a local gravel pit, hopefully adding micronutrients to the raised beds over time. For a potting medium, I've had luck running fully aged compost thru a leaf mulcher, resulting in a beautiful dark, soft mix. This potting soil can be a pain to make, depending on the moisture content of the compost. As a next step I plan on obtaining a digital microscope, so I can view microorganism activity on my computer monitor. This will help me determine the efficacy of my composting method. One reference here is Elaine Ingham's Microbe Manual. In conclusion, this is the stuff I use to grow my tomato "trees" and other healthy vegetables.